Regulation of translation initiation via phosphorylation of Ser51 in eIF2's α-subunit. 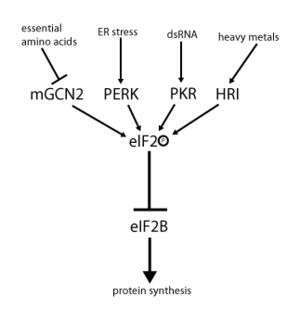 eIF-2 is a kinase enzyme that phosphorylates eIF-2. These are all responsible for the phosphorylation of the alpha subunit of eIF-2 at serine 51, one of the best-characterized mechanisms for down-regulating protein synthesis in eukaryotes in response to various cellular stress response's. ↑ Nika J, Rippel S, Hannig EM (January 2001). "Biochemical analysis of the eIF2beta gamma complex reveals a structural function for eIF2alpha in catalyzed nucleotide exchange". J. Biol. Chem. 276 (2): 1051–6. doi:10.1074/jbc.M007398200. PMID 11042214.